Now, Junglee Forays Into Classified Postings! In the recent billion day sale fiasco, sources confirm Flipkart’s losses were Amazon and Snadpeal’s gain! Looks like Amazon India doesn’t want to rest upon the laurels. Good work ethic. Just days after the “pay with Amazon” service took off, Amazon’s product price comparison site, Junglee.com has added a feature similar to classified sites Olx and Quikr, wherein you can sell your used goods on Junglee itself. A new but calculated move by Amazon. Online classifieds is becoming a big business in India. Last month, Quikr raised $60 million funding and is now valued at over $300 million. The command a traffic of over 25 million visitors a month on their site now. 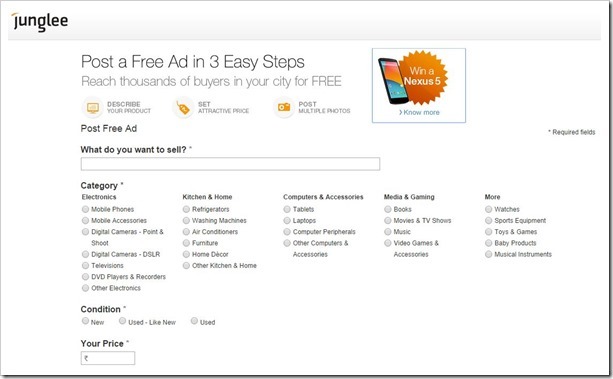 OLX is not far behind and gets similar footfalls on their site as well. Junglee.com which was till now a product comparison search engine is now entering into a category that they think is a logical extension to what they are doing currently – Displaying product pricing aggregated from various source. It looks like they want to add another source in their aggregation which is much bigger – the online consumers. If the used product is searched on Junglee, which has been uploaded by one of the consumers, they will probably choose to show the listing separately. If the price is right, the visitor may even go for it. Uploading a classified listing on Junglee is quite easy as well. Just visit the “Post Your Ad” page, upload item’s photo, description and your desired price with your contact details. In addition, Junglee has also partnered with Quikr, so one can now compare the prices of related items under the head “Related product listings from sellers”. So Junglee stands to benefit from this new marketplace. The market for used goods is dominated by players like OLX, Quickr and other rising online players like junabazaar and secondhandmall. Now with Junglee diving into the calm waters, there will be a whole new scenario for other players. Junglee has this feature activated in 9 Indian cities like Ahmedabad, Bangalore, Chennai, Hyderabad, Jaipur, Kolkata, Mumbai, New Delhi and Pune. Not only posting ads, one who’s looking to buy can easily compare prices of these used goods with Quikr. Since the services are still in infancy, you might have limited listings but with the ease of posting your ad surely in the coming days, Junglee will start to appear in the used goods searches. And as an introductory offer, if you post a ad on Junglee, you stand to win a Nexus 5 – so go ahead, check out your drawers and cupboards for old mobile phone or gadget. Who knows you might get lucky! Olx works without app including photo upload,quikr works partially without app photo upload is not possible.